20 nights. 20 supper clubs. 20 cuisines. Around a 15 metre worldscape table. During the games. I’ll be blogging every night, our progress around the world. See you here and see you there! Book now! Guest Chef: Chris Massamba from Full House Supper Club and Sundia Food is our guest chef for the first night of the Feast. The food will be not only West African (and folks, a little geography lesson here, Mauritania is not the same as Mauritius) but raw and vegan. Intriguing! Guest Chef: The Italian Supper Club was established in 2011 by three Italian food and wine lovers, Silvio, Chiara and Toto. Their aim is to bring the unique atmosphere and authentic flavour of the ‘Bel Paese’ to East London. Chef Toto will be making fresh pasta for 80 people. Rather him than me. Should be delicious! Guest Chef: Italian chef Cinzia Ghignoni from The Table will also be sharing chef duties on Mediterranean night. Cinzia is the new head chef at Southwark favourite The Table, where she has just put together a modern Italian menu, using top quality British ingredients. Originally from Milan, she has been based in London for the past 22 years. Her impressive pedigree includes working with the likes of Angela Hartnett and at Soho’s Duck Soup. Guest Chef: Denise Baker-Mclean from the Moel Faban Secret Supper Club is our Welsh guest chef for British night. Denise won the Welsh regional heats on Britains Best Dish last year and received a nomination for the North Wales local food hero awards in 2011. Guest Chef: Aoife Behan is our Scottish guest chef for British night. Aoife Behan is one half of Jelly+Gin Productions: a dining events collective in Edinburgh. Formerly a supper club hostess, Aoife is now focusing on guerilla dining in unusual locations with Burgher Burger. I will be cooking a British classic for the main course: fish n chips with home-made tartare sauce. Guest Chef: Linn Soderstrom from Stockholm based supper club Hemma Hos Linn will be flying in from Sweden to be one of our guest chefs on Northern European night. Hemma Hos Linn is a Stockholm based club where the professional chef Linn invites 10 guests once a month to her home for dinner. Linn is bringing over Swedish herring (kindly sponsored by Tomas) and Aquavit. Heavenly Swedish food! Guest Chef: Claudia Stachelhaus from The White Room Supper Club will be our second guest chef tonight. The Whiteroom Supper Club is an intmate underground restaurant set up by Claudia in 2010 when she decided to take a break from her banking career. 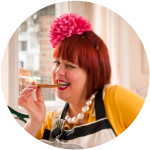 Since then, in her stylish and trendy Shoreditch apartment, she has run countless supper clubs and private parties, each time enchanting her guests with seasonal European food with a German twist. Wine will be provided by Merry Widows which specialises in Austrian wine. Guest Chef: South African born Arno Maasdorp from the Saltoun Supper Club is our guest chef for Central African night. Arno puts his 20 years of restaurant and food experience to good use offering guests delectable delights every week at his luxurious home in Brixton. Arno has got me sourcing ostrich meat and kudu fillet for his original take on traditional South Africa food. Wine will be provided by Wines of South Africa.